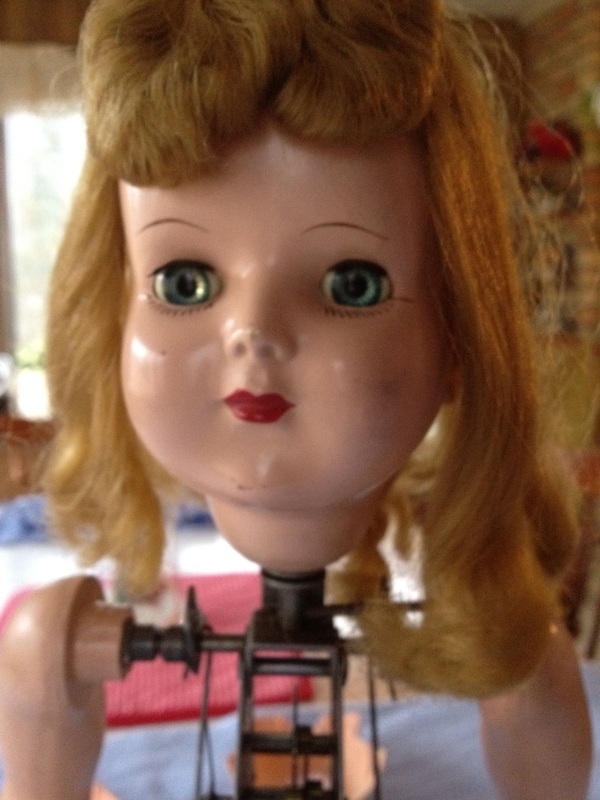 Walking Wanda was manufactured by the Advance Doll & Toy Co. circa 1951. She is 18 inches tall and unmarked. Her exterior is all hard plastic. Her hair is a glued on blonde or brunette saran wig. Some outfits for the Wanda dolls were designed by famous designers. Wanda came in at least three styles: little girl, skier, and drum majorette. She wore a sash which said either, "Wanda The Unaided Walking Doll" or "Wanda The Walking Doll". (source: Phonograph Dolls and Toys by Joan and Robin Rolfs, First Edition, 2004). My sister acquired the Wanda (Figure 1) that is the subject of this posting through eBay. 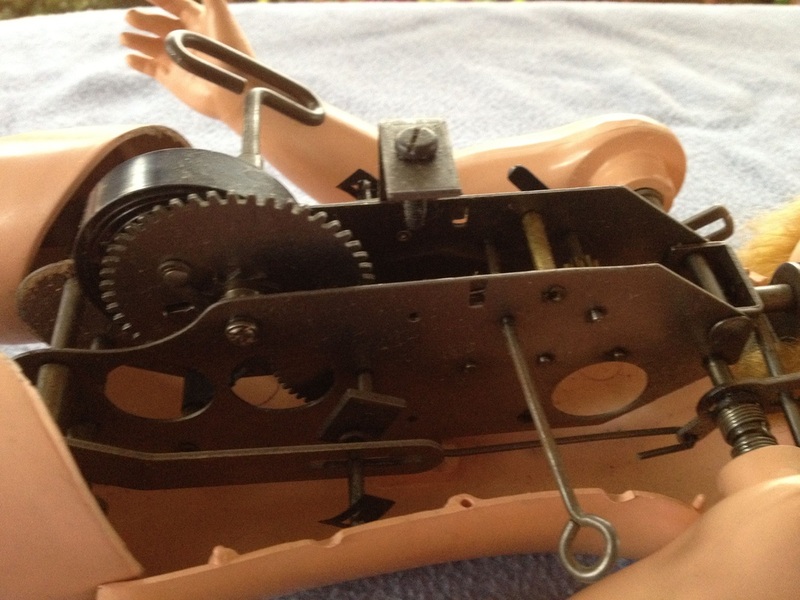 Her torso was not attached (the seller did not realize that the bolts for attaching the body halves were screwed into the clockworks). She was fairly dirty (Figures 2 & 3) and could not walk unaided. As Figure 1 shows, she was missing the tube stocking that would normally be stapled to the ankle. Figure 4 showcases Wanda's innards. Wanda has a windup clockwork mechanism that allows her to shuffle forward on her permanently attached roller shoes while swinging her arms and turning her head from side to side. For a really good explanation of the mechanism (with schematics), you should read US Patent 2695472. Wanda's winding key is on her right side. The smaller metal loop projecting from her left side is pulled outward to activate her movements or pushed inward to stop her movements by arresting a governor. There is a bolt in the belly button area that attaches the front of her torso to her clockworks. There is a corresponding bolt on her back. Her protruding belly is necessary to accomodate the clock spring when it is in its unwound state. The hard plastic body halves shrunk in a non-uniform manner over the years. They no longer fit together as designed. Images of other Walking Wandas show that this is a common ailment. The pieces still mount but the seams are not even. Figure 8 shows the portion of her mechanism that moves her arms and turns her head. The dual springs in the shoulder allow her arm to be rotated independent of the walking motion. This also prevents her arms from locking up on the key and start/stop pin when in motion. Fixing this Wanda was pretty straight forward. Some of her long hair had gotten wound around the pin for the gear shown in Figure 2. Tweezers were used to remove the hair. The mechanism immediately began working; making a loud whirring and clacking noises. Fortunately, my father repairs antique clocks and clock oil was readily available. 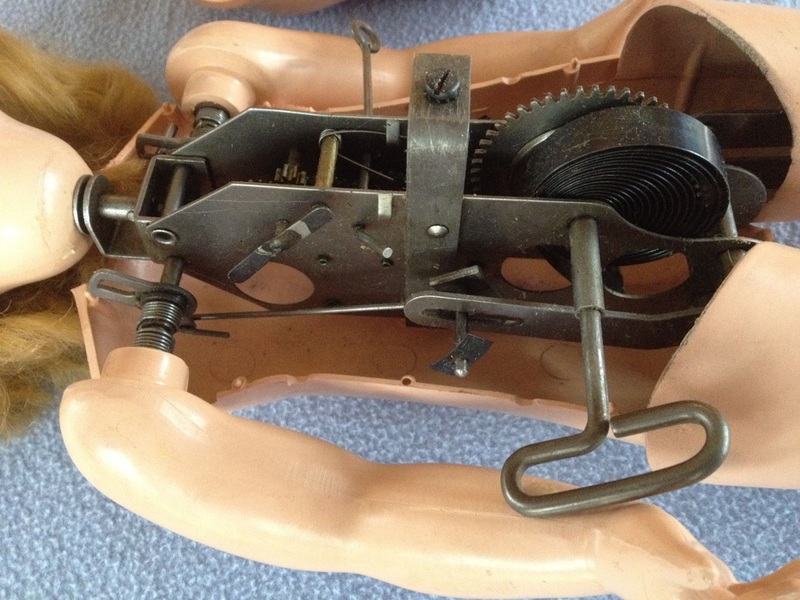 I lubricated the drive mechanism which reduced the noise and noticeably sped up the body movements. I shot a video clip of the reassembled doll walking on the dining room floor. Unfortunately, I shot the video at a 90 degree angle : ) She started to moonwalk in circles because a crumb caught in her shoe rollers. She is a little top heavy and it is probable that many Wandas stumbled and busted off fingers while being played with by their original owners. Figure 1 - Full body shot of Walking Wanda (after cleaning and repair). 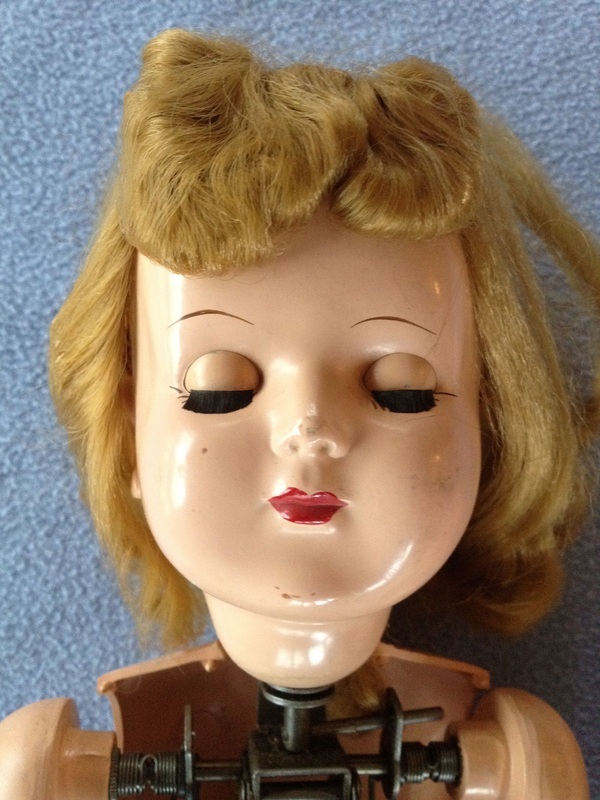 Figure 2 - Wanda's wig and dirty face before cleaning. Figure 4 - Wanda's clockworks. 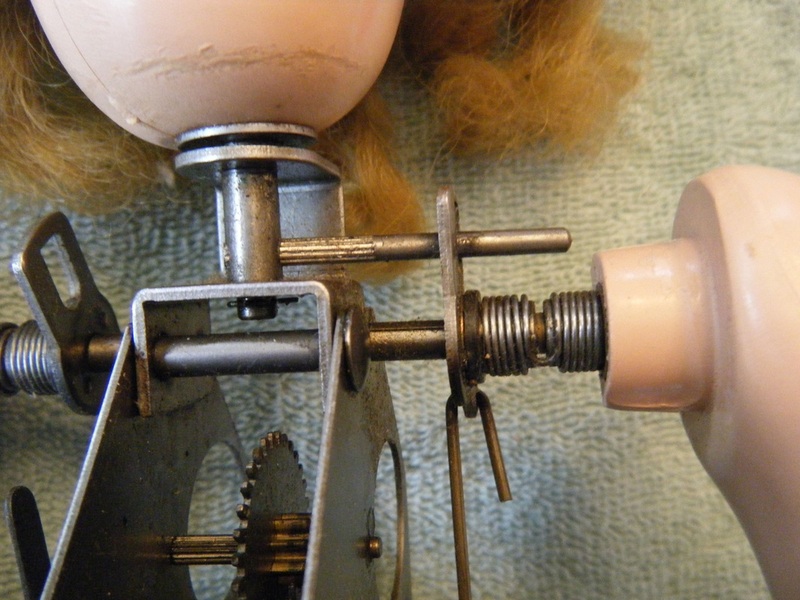 The linkages running through the legs to the rollers in the shoes are not accessible. Figure 5 - Wanda's winding mechanism. Wanda's belly is large to accomodate the mainspring when it is fully unwound. Notice how the key interferes with the arm. The propeller-like governor near her "armpit" is part of her "on/off" control. Figure 6 - A view of the push/pull pin that stops the governor visible in Figure 5. When the pin is pushed in, it jams the governor, which prevents the spring from unwinding to generate the walking motion. Figure 7 - Wanda's roller shoes are permanently attached. Notice how the left and right feet are identical - most likely to simplify the manufacturing process; a good way to keep the cost of the doll down. Figure 8 - The head and arm linkages. The dual springs in the shoulder allow the arms to be rotated independent of the clockwork action. The source of Wanda's movement troubles was hair wrapped around the pin of the gear visible in the lower right portion of the photo.